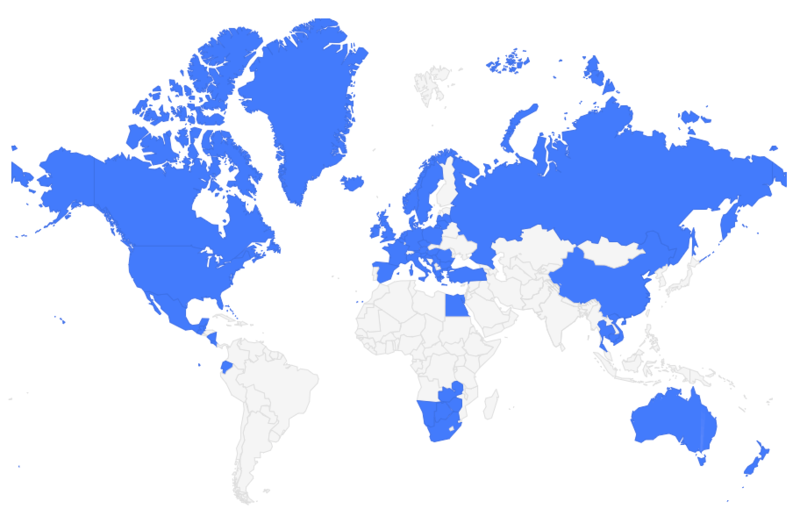 Whether you're asking travel experts for tips on how to save money on your next vacation, or inquiring about how we can help combat issues like overtourism around the world, there's one golden tip that is the answer to a lot of queries: travel in the off-season. The off-season or “shoulder season” in a destination is always going to be a better time to travel. It might mean that the weather could be cold or wet or maybe even really hot – but you'll be almost guaranteed to find lower prices and, most importantly, less crowds. And along with traveling in the off-season, we can also help alleviate the stress that popular destinations feel by broadening our focus. Instead of just focusing on the one big popular place that gets plastered all over Instagram, consider visiting lesser-known attractions nearby as well. As an example, let's look at Zion National Park in Utah. It's one of the most popular national parks in the United States – in 2017, it was the third-most-visited national park in the country, with more than 4.5 million visitors. Sure, Zion is pretty amazing whether you're a hiker or just a landscape addict. But the truth is that there are plenty of other places in southern Utah that are JUST as beautiful as Zion – they just don't get as many visitors or show up in as many Instagram hashtags. On my December trip to St. George, Utah, last year, I did my best to seek out some of the best outdoor spots that *weren't* Zion. And my favorite spot by far was Snow Canyon State Park. 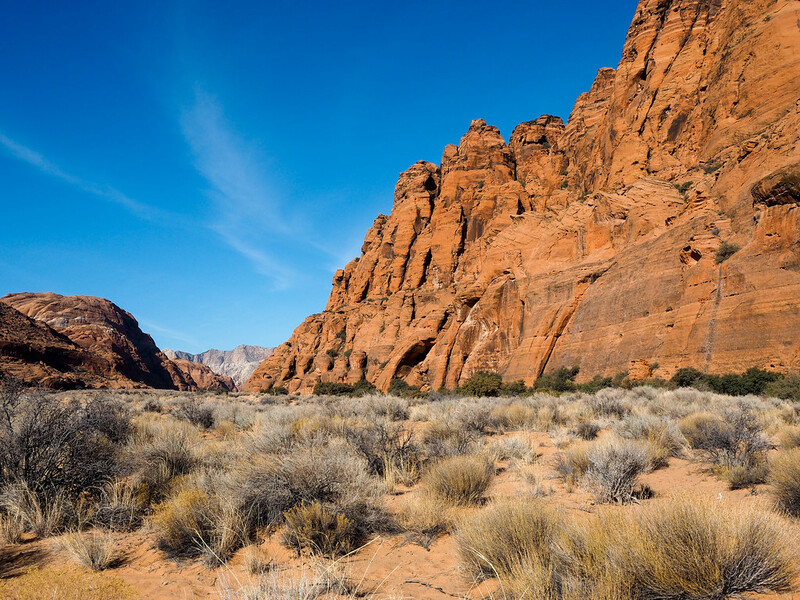 Snow Canyon State Park covers 7,400 acres in southwestern Utah, within the Red Cliffs Desert Reserve and about a 20-minute drive from downtown St. George. It's fairly popular as far as state parks go, but this isn't surprising considering the incredible landscapes you'll find there. 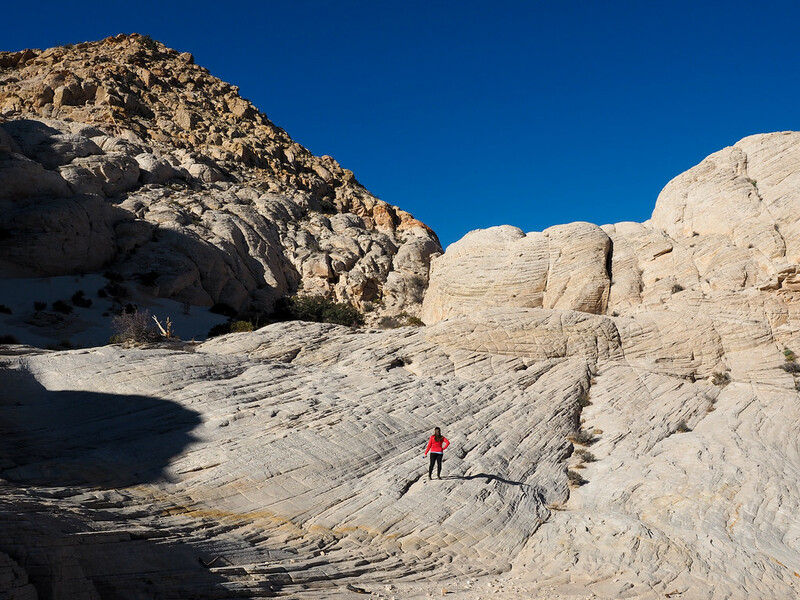 Snow Canyon State Park is known for its petrified sand dunes, sandstone cliffs, and ancient lava flows. Add to this desert plants and miles of hiking trails, and you basically have an outdoor adventure paradise. 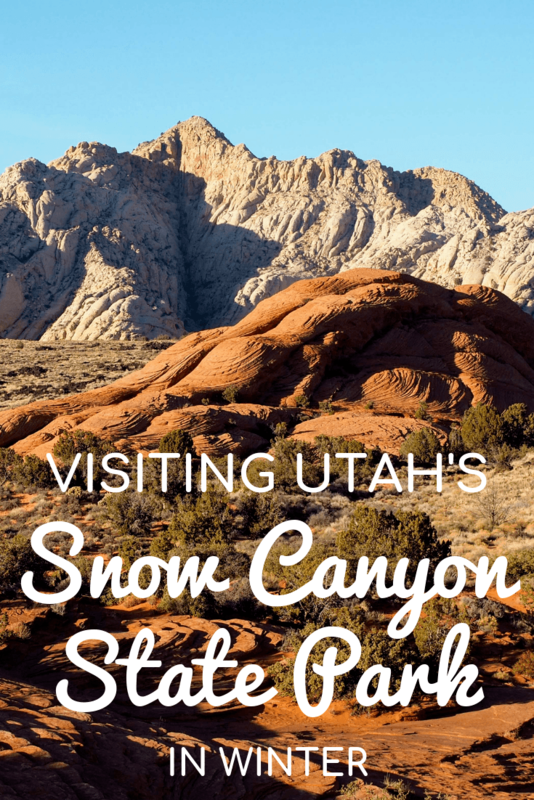 A common refrain you'll hear about this park is that, in any other state, Snow Canyon would be a national park. It's just that stunning. I dedicated about half a day to exploring Snow Canyon. Normally, this wouldn't be enough time to fully explore a park, but thanks to some short hikes and the fact that I more or less had the park to myself, I packed a lot into just one day. 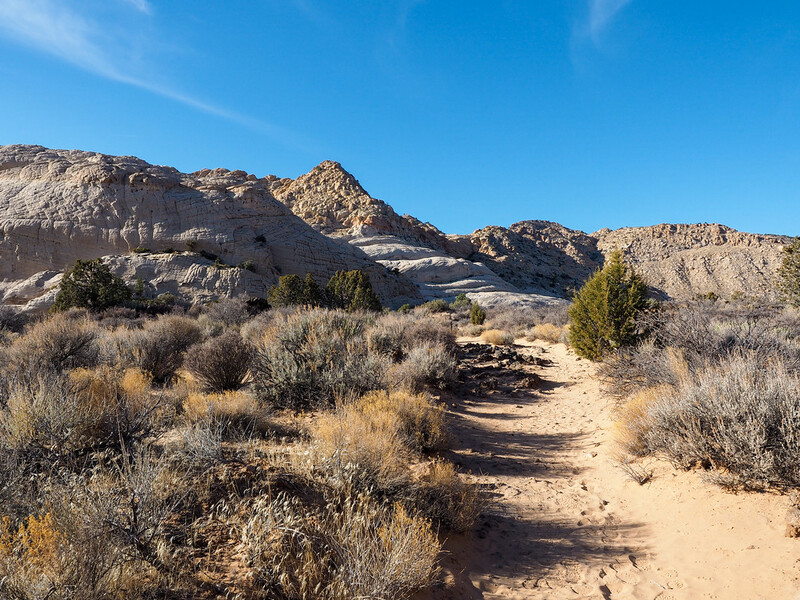 One of the first hiking trails you'll come upon after entering Snow Canyon State Park is the trail to Jenny's Canyon. 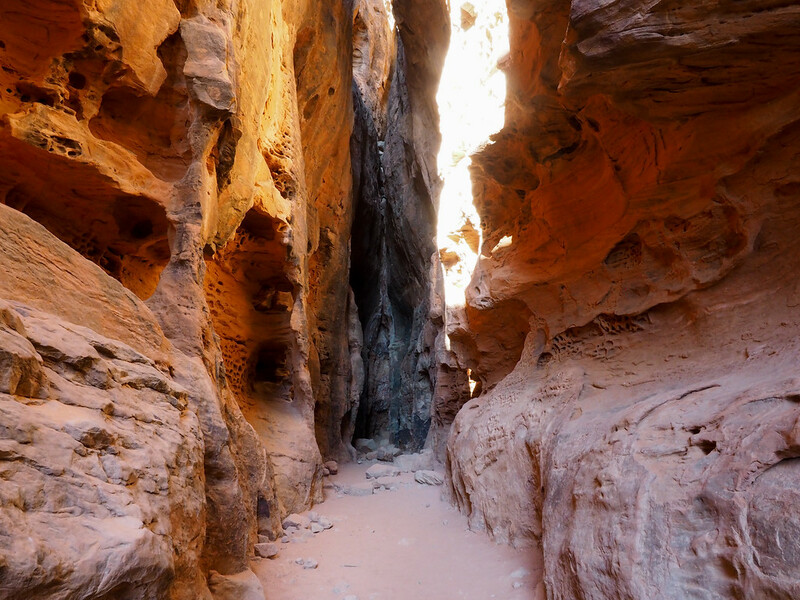 The “hike” to this little slot canyon is incredibly easy – just a quarter-mile each way on a flat, sandy trail. And the canyon itself is really impressive, even if you've seen slot canyons before. There were two other people in the canyon when I arrived, but after they left I had the place to myself to practice my tripod selfies. Major bonus to visiting a place like this during the off-season! Note: Jenny's Canyon is closed each year from March 15-June 1, in order to protect nesting falcons. From Jenny's Canyon, I headed to the other end of the park in order to seek out the Whiterocks Amphitheater. The quickest way to access this spot is to actually drive OUT of the park and make a left on Highway 18, where there's a parking lot and trail head. Mine was one of just two cars in the parking lot here, and I only saw one other couple on the entire trail! 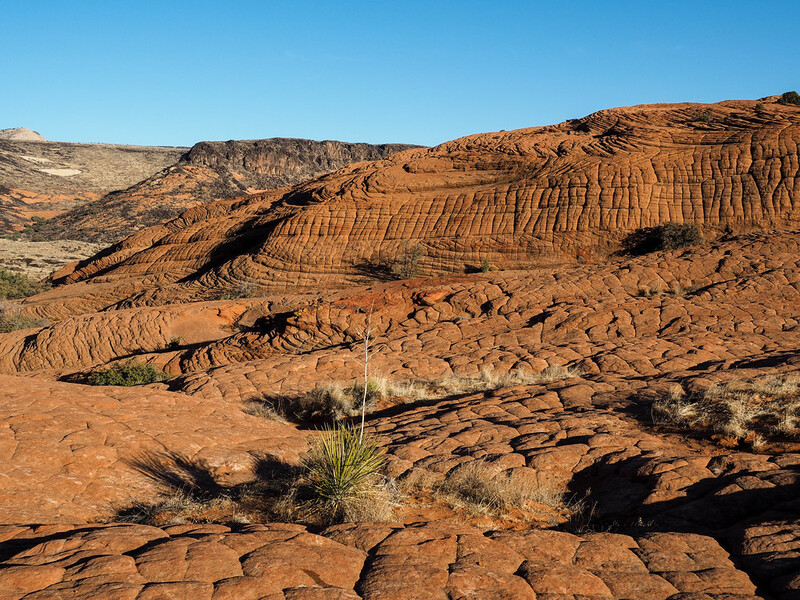 Speaking of the trail, it was mostly flat and sandy for the first bit, and then required a bit of scrambling over the white Navajo sandstone/slickrock that gives this part of the park its name. I eventually made it to the “Amphitheater” after less than a mile, and had the whole thing to myself for an hour. Seriously, guys – travel in the off-season! I could have continued on to the full Whiterocks Trail and then the Lava Flow Trail (many of the trails in Snow Canyon State Park intersect at some point), but I knew I wanted to be in a certain spot for sunset. 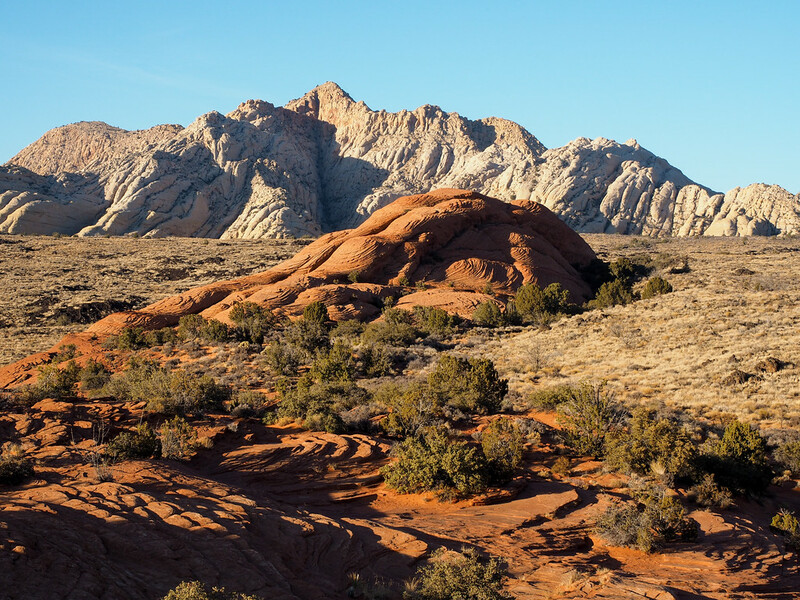 The last trail I tackled in Snow Canyon State Park was the Petrified Dunes trail, which winds its way around and over the petrified sand dunes in the park. It's an excellent place to be around sunset, as the dipping sun makes the hardened dunes appear to be glowing. 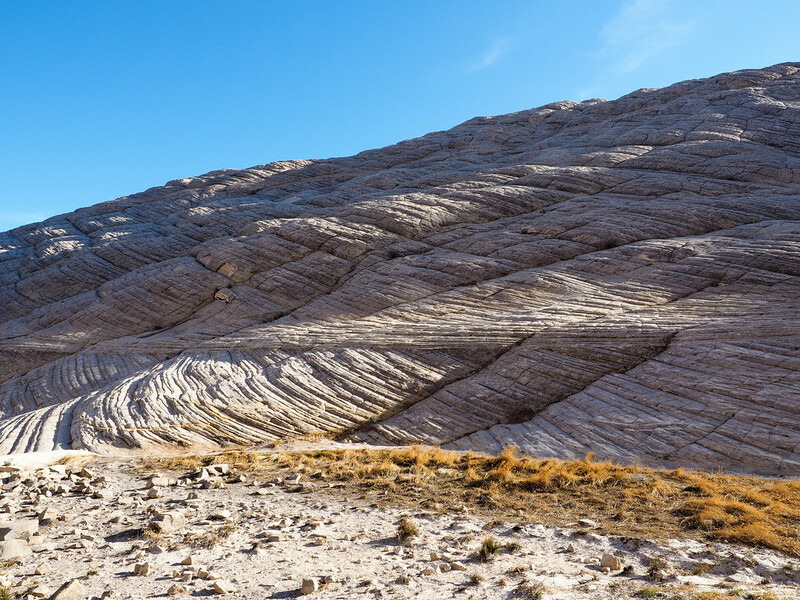 You can get to the Petrified Dunes trail a couple different ways. It officially begins at a parking area along the park's scenic drive that's shared with the Butterfly Trail trailhead, but can also be reached from the Upper Galoot Picnic area, or from the Three Ponds Trail. Parking wasn't an issue on a weekday in December, so I started at the Butterfly Trail trailhead. Walking over petrified dunes is pretty cool. It's crazy to imagine that these were once flowing sand dunes. The 1-mile trail here is technically marked, but the markers are few and far between. I think half the fun is climbing around on the former dunes and making your own trail anyway. I stayed in this part of the park until just before sunset, and made my way back to my car before it got dark. 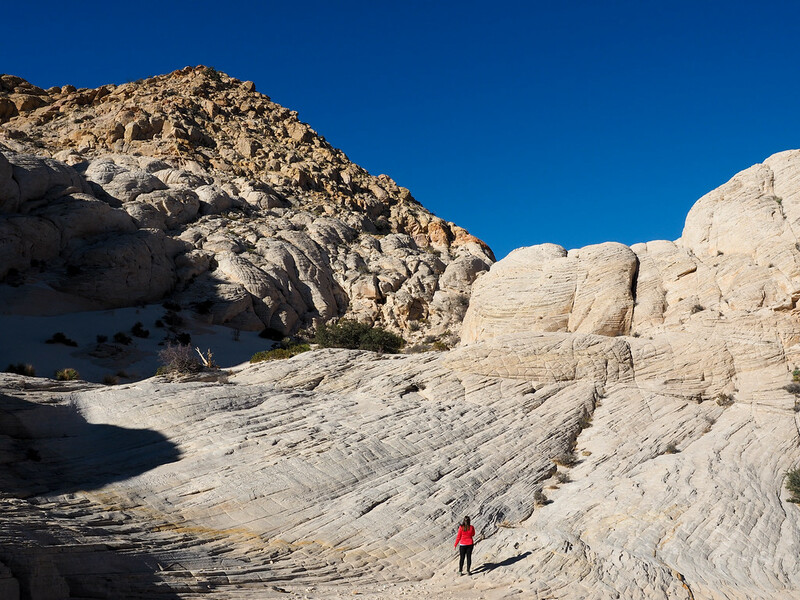 Like I said, most of the hiking trails in Snow Canyon State Park are connected, so you could easily hike from the White Rocks Amphitheater past the lava flows, onto the Butterfly Trail, and eventually into the Petrified Dunes. 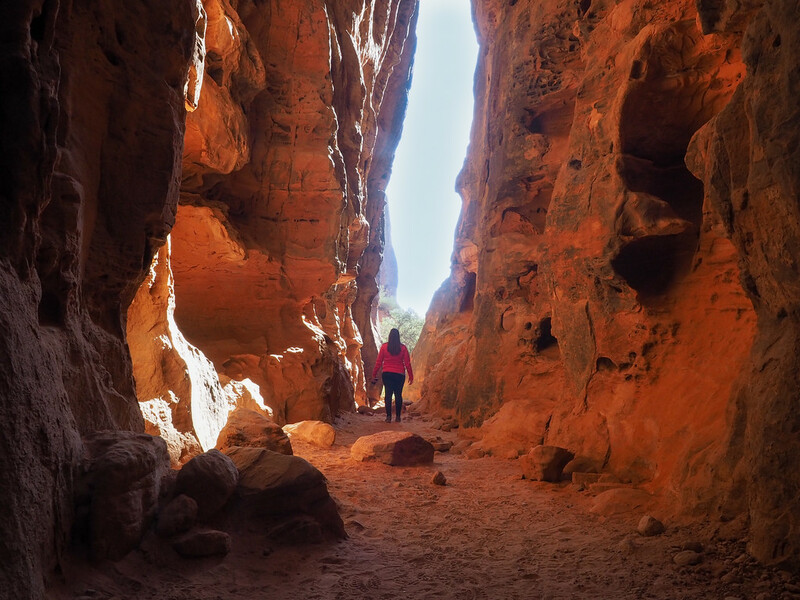 One separate trail that I didn't have time for was the Johnson Canyon trail, a 2-mile round trip that takes you to a canyon that ends at a red rock arch. This trail is only open from early November to mid-March; the rest of the year it's closed due to nesting birds. I'm sad I missed out on this one, but I'll just have to save it for next time! 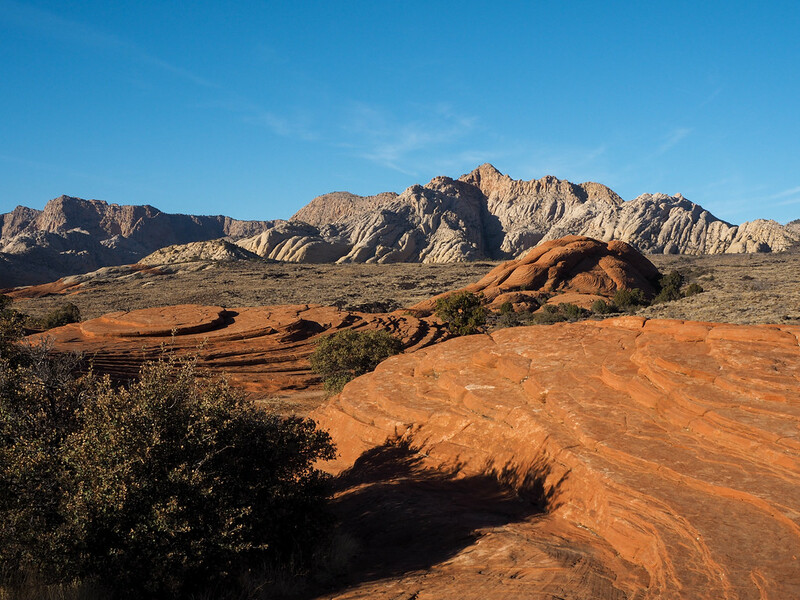 Check out all of Snow Canyon's hiking trails here, or learn more about outdoor adventures in southern Utah. 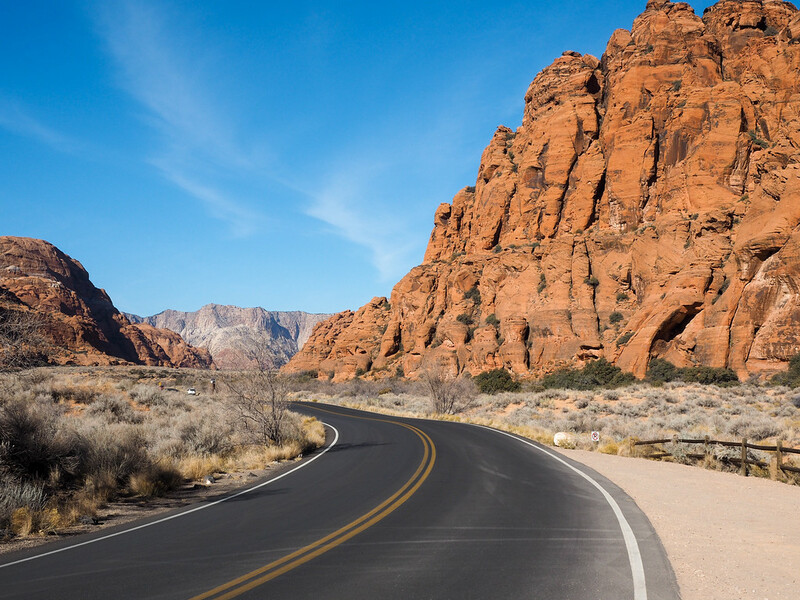 How to get there: You'll need a car to get to Snow Canyon State Park and explore on your own. It's about a 20-minute drive from St. George. Park entry: Day passes cost $6 per vehicle; you pay at a ranger station upon entering the park. Grab a park/trail map here, too! When to go: The park is open from 6 a.m. to 10 p.m. If you're visiting during the quiet off-season, any time of day is a good time to go. If you're visiting over a busy weekend or in the high season, going before 11 a.m. or after 4 p.m. will help you avoid crowds. 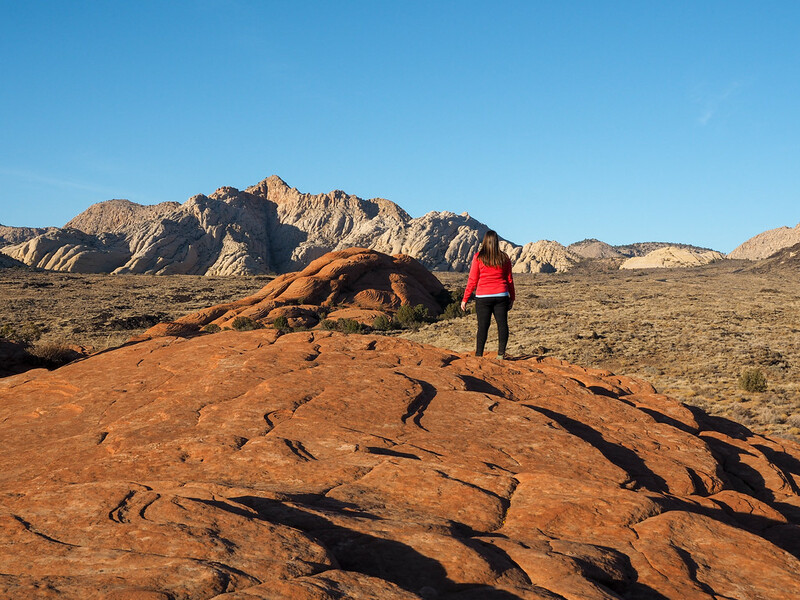 Where to stay: There's a campsite in Snow Canyon State Park, as well as accommodation options in nearby Ivins and St. George. If you're looking for luxury in Ivins, the Red Mountain Resort or The Inn at Entrada is where you want to be. Have you ever discovered a place that was better in the off-season? Note: This post was brought to you in partnership with Visit St. George and Travel Mindset. But, as always, all tips, opinions, and photos are my own! Yes, I love visiting national parks in the off-season. I went to Yellowstone my first time at the end of October. The snow-covered roads made it hard to navigate and most of the roads weren’t maintained, but I felt special to experience the park when most people don’t. Plus, snow always makes landscapes look so peaceful! Definitely! I’ve visited a few national parks in the winter and spring, and it’s always so nice. I imagine Yellowstone would be magical under a bit of snow! What an odd name for such a dry looking canyon. When I read the name of the canyon, I had expected something completely different 🙂 It looks beautiful though, and I completely agree with you when it comes to visiting off-season. It was named after two guys with the last name of Snow, which explains the weird disconnect if you assume it’s named for the fluffy white stuff! You should definitely make it to Utah sometime! The parks (national and state!) are really incredible. Nice Blog! I totally agree that visiting somewhere at off-season will be pretty amazing. Because you can enjoy and explore the place at fullest rather than crowd. Exploring these kinds of places is quite adventurous. Keep sharing! It’s definitely more enjoyable when you have a place virtually all to yourself! Great post! It’s a place I’ve never been, even though we live an Arizona! We’ll have to check it out! You should definitely check it out! It’s a beautiful park, and is close to lots of other pretty spots in Utah. Utah has so many great parks, both state and national. I’ve been a handful of times and am always finding new places to visit!